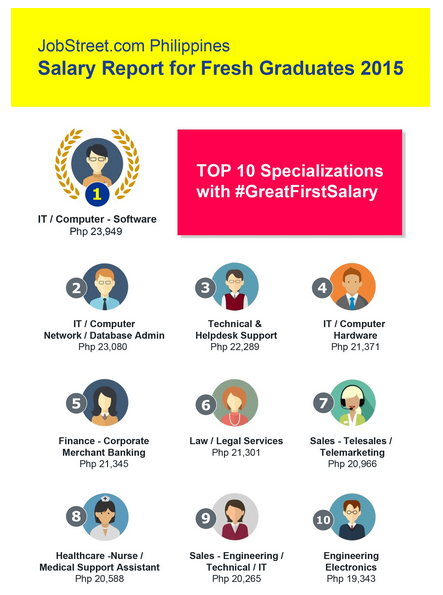 MANILA, Philippines - While fresh graduates wanting a job in the business process outsourcing (BPO) industry have it the easiest when securing first job, the highest salary go to information technology (IT) graduates, the Jobstreet.com has revealed in the 2015 edition of Jobs and Salary Report for Fresh Graduates. According to Jobstreet, the top 5 specializations with the most jobs available for those who just got their diplomas are related to the BPO or the call center industry. Out of the more than 40,000 fresh graduate jobs posted on JobStreet.com from January to March 10, 2015, close to 30 percent are vacancies for Customer Service specialists. Jobs in IT/Computer – Hardware, Technical and Helpdesk, Telesales and Telemarketing, and Clerical/Administrative Support round up the top five. On the other hand, fresh graduates looking for higher starter compensation may find them in the field of IT. Five of the top ten specializations providing the highest starting salaries to recent graduates are related to IT. Topping this year’s list is IT/Computer – Hardware (fourth in 2014), which gives an average monthly salary of nearly Php24,000 for fresh graduates. Fresh graduates specializing in IT/Computer – Network/System/Database Administration, Technical/Helpdesk Support, IT/Computer – Hardware, and Corporate Finance are also above the Php21,000 monthly salary mark.